This thing looks amazing, its a ball, you throw it into the air and when it gets to the highest point it takes a picture in all directions. 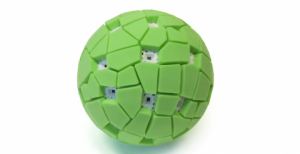 The ball camera has 16 different mobile phone camera modules installed around the sphere that take a photograph at exactly the same time when the ball reaches it’s highest point in the air. Then you simply plug it into your computer and you can get a full 360 panoramic image. I don’t think the camera is for sale yet but it’s definately on our christmas list.